Happy Valentine’s Day friends! I hope you guys are having a cozy one, either with someone special, or even just by yourself! 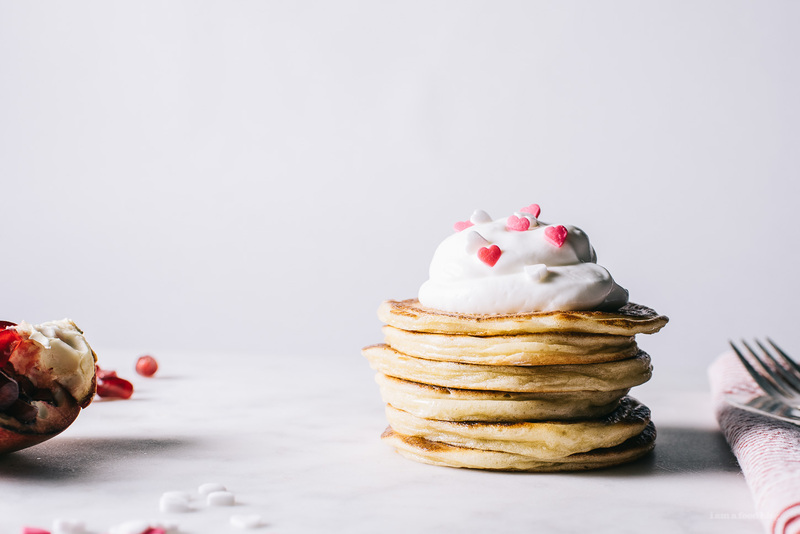 To be honest, I made and ate this little stack of Valentine’s pancakes all by myself because sometimes, a solo stack of pancakes is just what the doctor ordered. Mike and I are actually in Chicago for a quick trip – we’ve been meaning to walk around and really explore the city, but it’s so cold that we haven’t spent more than fifteen minutes out in the cold. Instead we’ve been whiling away the hours in cafes and grocery stores. Nothing makes me happier than wandering around a grocery store, especially one that has fun stuff that I’ve never seen before. Speaking of things you’ve never seen before, remember when greek yogurt was a newfangled thing? Before greek yogurt, there was just yogurt. It definitely wasn’t as popular, which I kind of get. I absolutely love the thickness of greek yogurt because it’s texture reminds me of sour cream which is one of my favorite things ever. And since I don’t typically go around eating tiny tubs of sour cream (would that be weird? ), I’m pretty happy that it’s socially acceptable to eat tubs of greek yogurt. I love yogurt and greek yogurt so much that I’m thinking of getting my own yogurt maker! I just need to look at more reviews like https://yogurtnerd.com/epica-yogurt-maker-review/. Greek yogurt pondering aside, Happy Sunday! 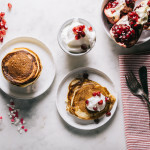 These greek yogurt pancakes come together in a flash and are a little dense, yet fluffy at the same time. They’re filling and have just a touch of that tangy greek yogurt flavor. I like them sans syrup, with some extra yogurt and fruit on top, but if you want to sweet-treat it up, maple syrup would be awesome. 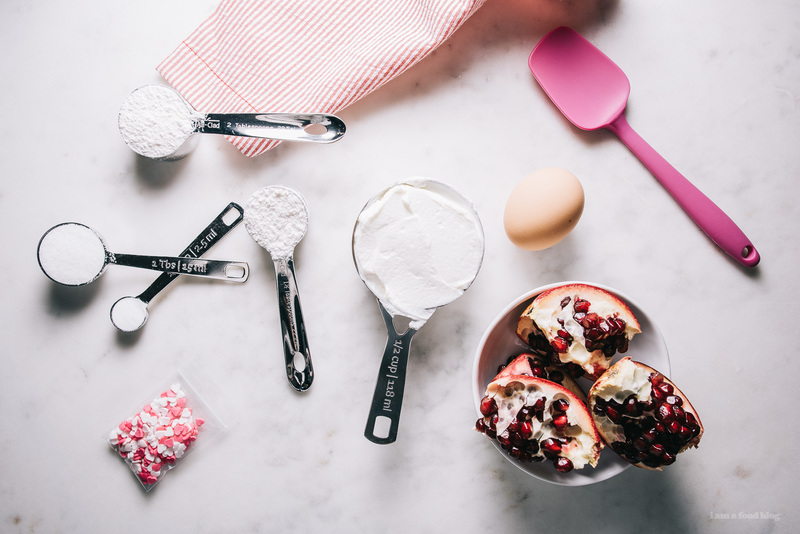 Whisk together the flour, sugar, baking soda, and salt in a small bowl. Place the greek yogurt in another bowl and sprinkle on the dry ingredients. Fold until just combined. Whisk the egg and vanilla in a small bowl and add to the flour yogurt mix. Use a spatula to fold until just combined. Heat up a non-stick pan over medium-low heat. Brush a thin layer of butter or oil on your pan. Drop the batter into the pan (I used a 2 tablespoon measure) and cook until small bubbles form on the surface and at the edges. The pancakes should be golden brown. Flip and continue cooking for 1-2 minutes, or until golden brown. Top with yogurt and sprinkles, if desired. Enjoy warm! i love going grocery shopping in a foreign place!! when i went to maui for a week last summer, i went to costco at least 3 times- they had 10+ kinds of poke, the biggest cans of coconut milk i’ve ever seen, and so many pineapples! These are so cute! never thought of adding yoghurt to pancakes, but they must taste good! Oh my! ♥ These look totally delectable! Pancakes are one of my all time favourite breakfasts + I’m definitely gonna add Greek yoghurt next time! Hi Steph, Thanks for the recipe I will give these a go. Do I use SR flour as most use it or is it just plain flour. I get confused with using which flour and same with when a recipe says OIL..which oil, extra virgin, olive, veg, flaxseed, grapeseed, canola?????? it’s plain all purpose flour and any oil will do as long as it doesn’t have much flavor – i prefer grapeseed or canola. hope that helps! Speaking as a college student, thank you so much for posting this recipe! Such an inexpensive, easy, and a yummy way to start this silly holiday. I made them with coconut extract, and put peanut butter and bananas caramelized with honey on top. These sounds so good! Too bad I already had breakfast..
Just discovered this recipe! Guess it’s breakfast for dinner tonight! Thanks! While you’re here, make sure to visit Lou Malnati’s and order the Lou. It’s worth the trek in the cold. Also worth visiting: the Art Institute, Eataly, and Big & Little’s. MM these look good! Thanks for sharing. 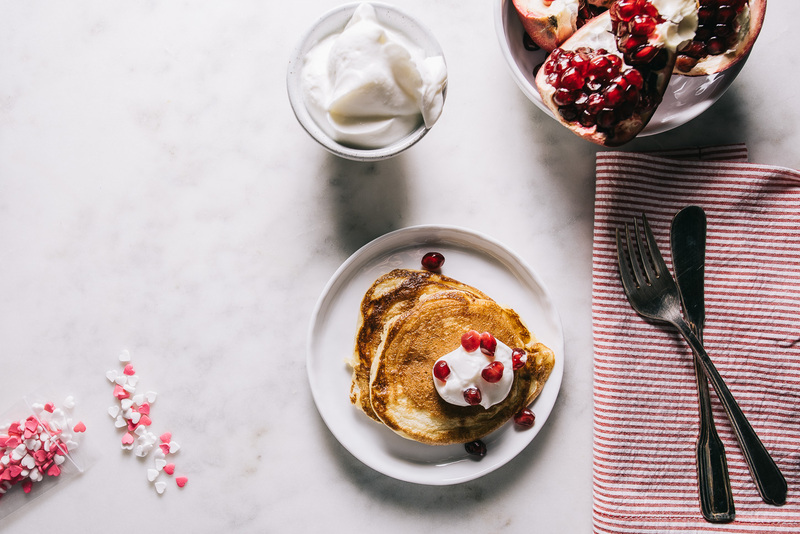 I love pancakes and I love greek yogurt, so this sounds great combining them together! I love how simple and easy this recipe seems and I can’t wait to try it the next time I make breakfast. I was wondering how many pancakes this recipe makes? I don’t want to make too many, that’s for sure! it serves 1-2 so i think you’ll be okay! how many pancakes it makes depends on the size of your pancakes. i made ones that were about 3 inches across and it made about 8 of them. hope that helps! I reaaaally have to love someone to want to share a stack of pancakes with them. I hope you and Mike stayed warm and enjoyed Chicago! 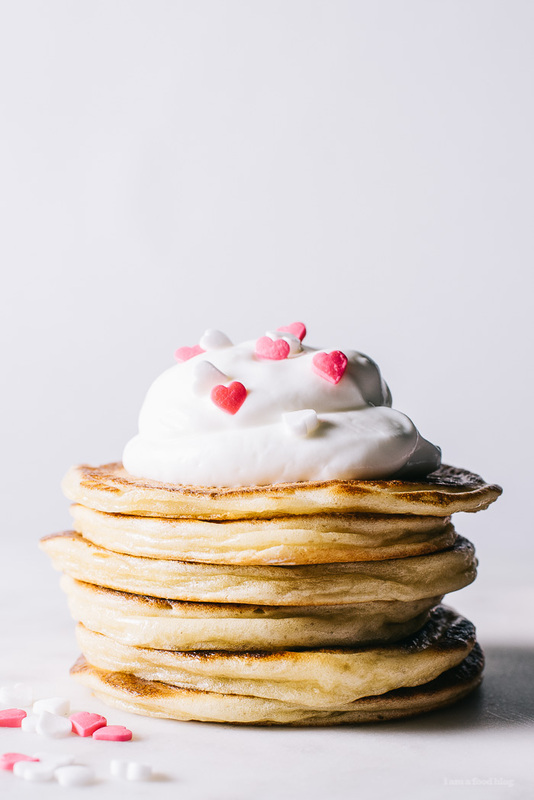 The hearts on these pancakes are so adorable! Eep!! We were greek yogurt brunch twinsies this week! Maybe we should have a whole yogurt themed brunch party?! I’d be in heaven. Except I also would hope have to insist that some of the dishes have sour cream, because I LOVE IT, TOO. Have you ever had sour cream with savory crepes?! Alana and I will take you take you to try this very thing in April! Eep, just got so excited. 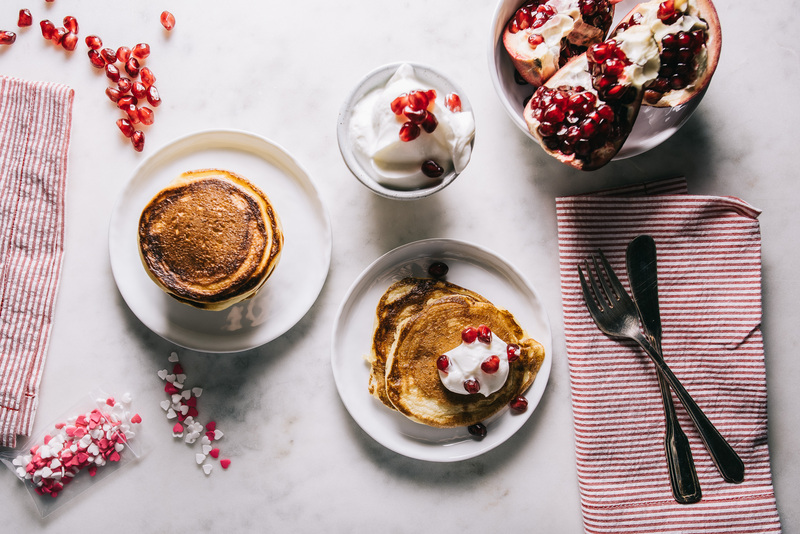 Greek yogurt pancakes 5evr! 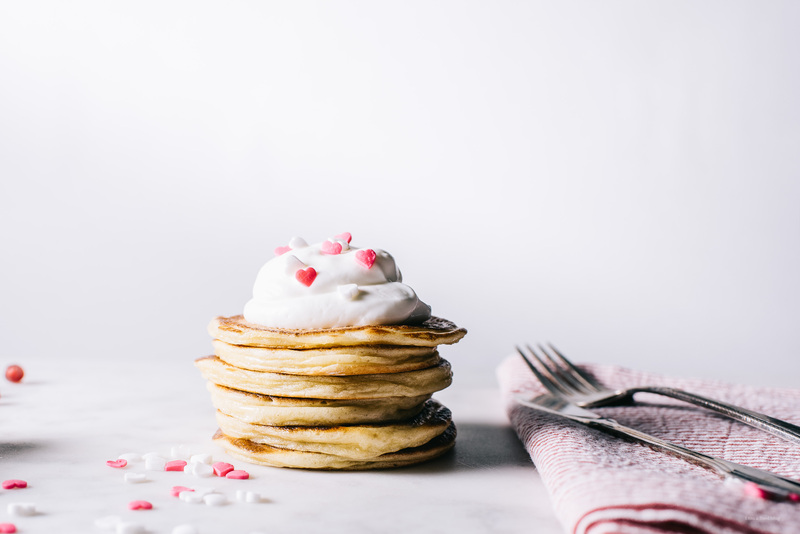 You had me at Pancakes! I’ve been experimenting lately with adding Greek yogurt as a substitute for certain things in food. This seems like a perfect breakfast treat to make this weekend with my wife! Amazing photos! Thanks for the share! I can’t wait to try them, I bet my son will like them too! Wow, this is such a good recipe. I am so glad i stumbled across your blog. Will have to try out more recipes. Sunday Brunch: Grilled Cheese Eggs Benny & a Giveaway!